rozen waterfalls, more than 60 Bald Eagles and a short “sugar bush” season make ACRES Land Trust’s Wabash County nature preserves a northeast Indiana outdoor destination right now. “Believe it or not, it’s a great time to visit a nearby preserve or venture into a new one,” said Jason Kissel, executive director and caretaker of the Mary Thornton Nature Preserve in Wabash County. 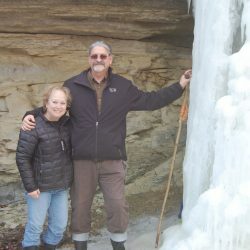 “The frozen waterfalls, iced-over lakes, creeks and rivers, 30-foot icicles at Hathaway Preserve at Ross Run, the Bald Eagle sightings throughout the Wabash County properties with more than 60 bald eagles bedding down in the immediate vicinity, and all the other winter wonders won’t be available much longer,” Kissel said. Both Hathaway Preserve at Ross Run and Kokiwanee Nature Preserve feature frozen waterfalls and are popular destinations for bald eagle enthusiasts. With member support, ACRES Land Trust offers 10 miles of trails in Wabash County for birding, photography, hiking and exploration from dawn to dusk. The Land Trust also is offering a special program, “Maple Syrup Making and Pancakes” on Saturday, March 14 at the Asherwood Nature Preserve in Wabash County. Visitors may stop by between 9 a.m. to 1 p.m. No reservations needed; $5 admission, children under 5 free. The Asherwood Environmental Center is at 7496 W SR 124. For only a few weeks a year, maple trees send sugar up to feed newly-forming leaf buds. Collecting sap at this time and boiling it down to perfect consistency is an ancient craft requiring patience. Visitors to the Asherwood maple syrup event will get a guided tour of the sugar bush presented by Bill Harmsen and Kissel. 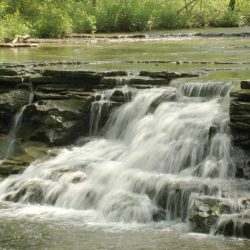 Hathaway Preserve at Ross Run, a 72 acre preserve located at 1866 E. Baumbauer Road, Wabash, features waterfalls, exposed bedrock and vertical cliffs as high as 75 feet. Kokiwanee Nature Preserve, a 140 acre preserve featuring bluffs along the Salamonie River and waterfalls, is located at 5825 E. 50 S, Lagro. Membership-based since 1960, ACRES Land Trust is dedicated to preserving significant natural areas in northeast Indiana, northwest Ohio and southern Michigan. ACRES protects more than 5700 acres on 94 properties and offers more than 70 miles of trail.